Dogs don't like rancid food -- it smells bad and tastes even worse. It can cause dangerous health problems, including diarrhea, cancer, liver and heart ailments; it can even cause death. Proper selection, care and storage of your dog food are the best ways to prevent it from becoming rancid. To make sure you don't accidentally give it to your dog, you should be aware of the characteristics of dog food that's gone bad. Detecting rancid dog food is relatively simple if you know what you're looking for. Check the processing or manufacturing dates on the label of your dog's food. If the food has expired, it may be rancid. 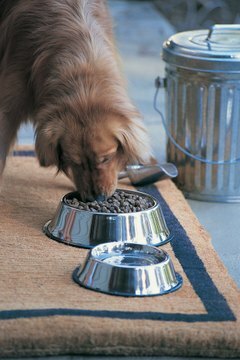 Most dog foods will have an expiration date; use it as a guide to initially determine if the dog food has spoiled. Look for changes in color. Most dog food, dry and wet, is a deep brown color. If the dog food is green, black or even a deep blue, you shouldn't feed it to your dog. Smell the dog food. If the dog food smells different from what it did when you first opened it, there's a good chance the food has spoiled. Rancid dog food will usually have a foul smell that's easily detectable. Evaluate the way the dog food is stored. If you keep the dry food in the package it came in, it may become rancid. Dog food left in an open bag for more than 24 hours is vulnerable to going bad. If you must leave it in its original packaging, seal it as tightly as possible. An opened can of wet dog food should immediately be covered with foil and stored in the refrigerator. It can go rancid within hours if you don't refrigerate it. Look for signs of mold on the dog food. Throw away the whole bag or can even if only a small portion is moldy. Buy dog food that was produced as recently as possible. Transfer dry dog food from its original packaging to an airtight container made out of plastic or wood. If refrigerated, wet food shouldn't be fed to your dog more than two days after opening. Never feed your dog rancid dog food. Do not feed your dog food that has expired.